We are pleased to announce the launch of the My Trusty Little Sunflower Cream Twitter feed. Follow us @my_trusty now to get an insight into the progress of the cream, receive exclusive offers and help spread the word of our fantastic little cream and remember, it’s all for a good cause! The launch of the product has been well received in the press, which is wonderful news for My Trusty and The Trust. The Mail on Sunday printed an article about our great cream, as did the local BBC news, and we also featured on the first page of the Health section on The Mail online. This has generated a lot of interest around the cream, as people are wanting to try the moisturiser for themselves; in turn having fantastic impact on sales. Buy your Trusty Little Sunflower Cream now. Our Facebook page is now live . If you like the product as much as we do and want to keep updated with the latest news, then why not head over to Facebook and Like us?! Here you can also find pictures from the launch event, read the articles, see other people’s comment and post your own thoughts on the product. On the 12 April our fantastic new product was launched. In attendance were a number of media personnel as well as local people and different members of the hospital’s teams. We gained local radio coverage as well as a slot on BBC TV South today. All in all a great day! Buy now! With the official launch date only 4 days away, our beautiful new tubes have been filled in Suffolk and My Trusty Little Sunflower Cream is now available to purchase through our website. 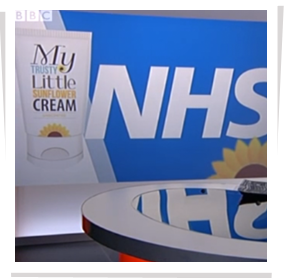 Interest is already being generated in the media about our cream and you can now be one of the first to try My Trusty Little Sunflower Cream and see the benefits for yourself, buy now!